Cormac Hollingsworth explains why the government’s chosen the wrong way of dealing with Northern Rock, and points out what they could have done better. The Virgin Consortium is using £250 million on Northern Rock’s balance sheet to pay the taxpayer for the bank, and yesterday we saw that they can likely free up another £345 million of extra capital from the Rock in the near future. Today, we’ll show how that full £600 million of money taken out of the company, could be added to the banks bonds issued to pension funds, insurance companies and other institutional investors, could have been used to underwrite £10 billion of mortgage new lending. That £10 billion is equivalent to the banking industry’s current entire annual net mortgage lending. That’s why those hoping to buy a home should be very upset at how the Northern Rock sale has been managed – in the same way the Glazers used Manchester United’s financial strength to pay the shareholders of Man Utd. As a result homebuyers will be much worse off. That’s because mortgage lending is very scarce right now. According to figures from the Bank of England, since 2008, the average lending was £800 million a month. That is half the average of lending Apr 1993 – Mar 1994 of £ 1.5 billion a month, while, during that period, the average UK house price in was less than half of what it is today, according to Halifax House Price Index. Credit easing (essentially printing money) is one of the government’s policy weapons that they are hoping to deploy effectively to help the many people constrained by credit. Meanwhile, on Monday, Grant Shapps announced 100,000 new mortgages up to 95 per cent of the value of homes, with a fund that indemnifies the mortgage lender against 12.5% of the value of the house, of which the government underwrites 9% of the price of the house. The government reports that scenario testing is for this to lose the taxpayer tens of millions of pounds. Additionally, the government will provide £400 million to help build 16,000 homes. That measure, in addition to the 100,000 mortgages promised by the Shapps mortgage initiative, worth approximately £16 billion at today’s prices – or, 20 months of the banking industry’s net mortgage lending – amounts to important support. We have to hope that it works, because unemployment is rising and this will put pressure on housing. What is peculiar is that before Grant Shapps gave his statement to MPs about this new policy, Treasury minister Mark Hoban made his statement on selling off Northern Rock. They were related, although clearly no-one thought to mention it. But let’s ask the question Mark Hoban and Grant Shapps didn’t ask: What if this excess capital on Northern Rock’s balance sheet was all put into mortgages? First, they’d have to figure out how to do it, as public ownership wouldn’t work because the EU has limited Northern Rock on the deposits it can take. But remutualising Northern Rock would provide the path to getting it out of public ownership and allowing it to fully use its clean balance sheet to start lending. We saw yesterday that the FSA has imposed a lower Tier 1 limit of 15 per cent of risk weighted assets on Northern Rock – that is the ratio of assets, to the loans it has given out that it can expect to be repaid. It will have justified this by saying that, like a building society, the privately-held Northern Rock will not have access to external capital. So we should assume that if Northern Rock had be remutualised, the Tier 1 ratio would also remain at 15 per cent. 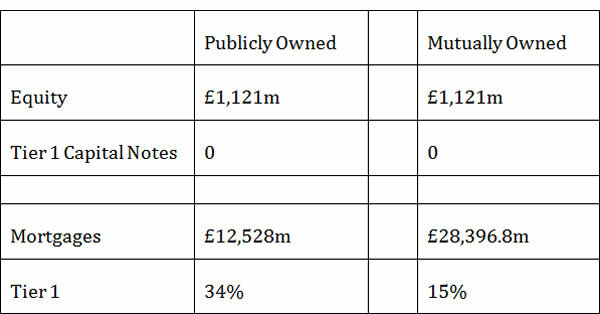 So a remutualised Northern Rock would have lent £10 billion more than the Virgin-owned Northern Rock. How much would that have cost the taxpayer? It’s been estimated that the members of the mutualized Northern Rock could afford to pay the government around £300 million for the bank. That is £450 million less than Mark Hoban announced as a sale price. But interestingly enough, it’s very close to the £400 million investment fund that Grant Shapps announced right after Mark Hoban sat down. Grant Shapps’s policy will support 16,000 homes, a mutualised Northern Rock would have supported 64,000. 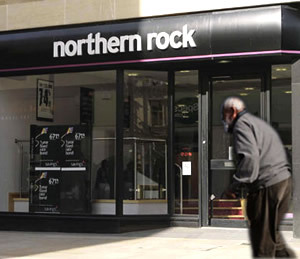 The advantage of using Northern Rock’s balance sheet is that it is a bank. There are no government funds and administration, each that has the potential to both slow down and make the government’s policy ineffective. It’s quite possible that the administration of the government’s scheme is so poor that they’ll come to regret that they didn’t remutualise Northern Rock. What we can say confidently is that homebuyers have every right to be very upset, they’ve been done out of a doubling of mortgage availability. They’ve been well and truly Glazered! Where did this £300m from customers come from by the way? 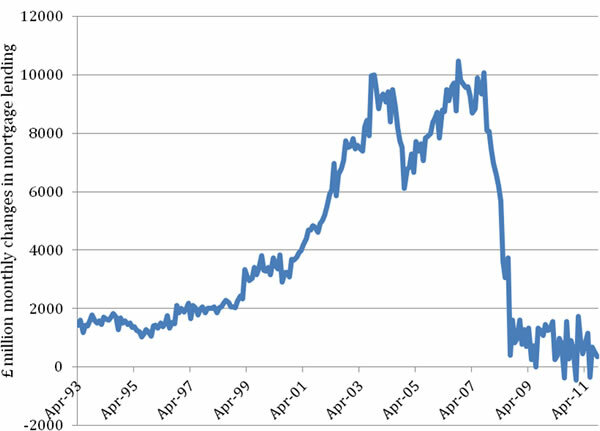 http://t.co/ReoKGraB if you thought the sale of #northernrock was bad…..read this! http://t.co/ReoKGraB @OccupyLSX seems you can actually buy a bank for free nowadays. We're all missing a trick!